BECOME A CHESAPEAKE BIBLE INSTITUTE DISTANCE LEARNING CENTER. At one time in our country, the Church was recognized for the significant educational responsibility it shouldered. It is time to recapture that mantle of responsibility! As pastors, we lament that many people do not seriously study the Word of God. On the other hand, our church structure is often limited in how much we can give our members. One pastor of a successful and dynamic church noted, “We do not have a vehicle in our church for the didactic teaching of the Word.” Now, there is a way! If you are a pastor, you already know you are a counselor, a teacher, and an educator. Now, see yourself (or someone designated by you! ), also functioning as a Distance Learning Center director as well! You plan the curriculum, monitor the progress, provide guidance and oversight to a staff of instructors, recognize achievement, and prepare people for ministry. You lead the shaping of minds. By establishing a School of Ministry, your local church becomes the focus, or the primary school, of learning. The School of Ministry, then, reduces the siphoning off of energy from the local church by para-church organizations, because it brings spiritual education back where it belongs, enables students to retain the God-given vision of their local body, and retains serious-minded members, who will be less prone to think they “are not being fed” since there is now an avenue for real advanced learning. This, in turn, fosters greater church loyalty and appreciation for the pastor and church leadership. Establish a Working Relationship with Chesapeake Bible College & Seminary. Chesapeake Bible College and Seminary has satisfied all the criteria for the status of an exempt religious-degree-granting institution as set forth in Section 11-202 of the Education Article of Maryland. This enables the school to legally share its ministry with local churches. Chesapeake Bible College and Seminary is fully accredited with the Accrediting Commission International, located in Beebe, Arkansas. The College will accept a certificate of completion for courses taken at approved schools of Ministry. Such courses may then be accepted by the College for credit. First and foremost, the School of Ministry within a local church is designed to strengthen the ministry of the local church pastor, upon whom the Bible confers great honor. Therefore, nothing is ever done to undermine his authority. The end result of the school of ministry is the training, equipping, affirming, and empowering of church members through the fulfillment of Ephesians 4:11. Chesapeake Bible College and Seminary is interdenominational in scope and duly recognizes the authority and autonomy of the local church. Therefore, it will not interfere with the local church’s life, discipline and doctrine. Our services are offered to the local church as a blessing, not as a legal affiliation. The School of Ministry within the local church, then, defines itself as a ministry of that local church. The local church, as a legal entity, separate and distinct from Chesapeake Bible College and Seminary, is responsible for its own insurance liability. The first step in establishing a relationship with Chesapeake is to invite a college representative to meet with the local church pastor and other church leaders, to discuss the possibility of establishing a working relationship by opening a School of Ministry under the supervision of the church. The college representative, at the pastor’s request, is also available for additional meetings to explain the standards, curriculum, record-keeping procedures, and other aspects involved in operating a School of Ministry. There is no law in the United States which prohibits a church from training its members through a School of Ministry. By the same token, a church may also open its School of Ministry to the community at large. However, the church must properly identify its school and must be careful not to overstate its academic capacity. In most states, the terms “college,” “seminary,” “university,” “credit hours” cannot be used legally. A clear distinction must be made between the local church and Chesapeake Bible College and Seminary. In many states, churches are not authorized by law to grant religious degrees. Therefore, in establishing a School of Ministry, it is not possible to incorporate the name “Chesapeake Bible College and Seminary” in its name. In such states, schools of ministry may be identified as “Chesapeake Bible Institute of Anytown School of Ministry” or similar. Your college representative can provide guidance in choosing an appropriate name. Director – The Director oversees & handles all course material orders and manages the promotion for your School of Ministry. Registrar – The Registrar keeps both academic & financial records for your School of Ministry. This person must be responsible and is the main contact between your School of Ministry and CBCS. If you are considering starting a Distant Learning Center, then you will want to be praying about who could fill these three positions in your ministry. Sign-up! 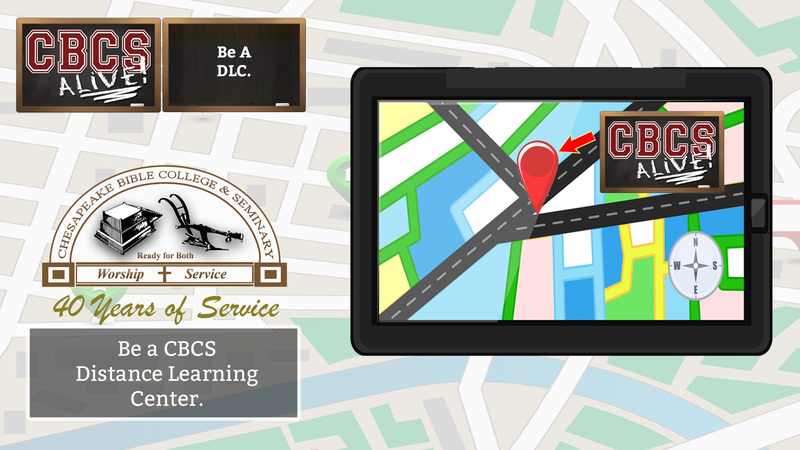 The pastor, or someone designated, becomes the Distance Learning Center (“DLC”) Director of the local School of Ministry, by completed the application process with Chesapeake Bible College & Seminary to be recognized as an official DLC. The Learning Center Director is ultimately responsible for all aspects of the local Distance Learning Center operation including curriculum, course selection, classroom requirements, designation of teachers, registrar duties, etc. Designate a Registrar. The Distance Learning Center Director designates a Registrar. This responsible church member takes attendance, collects registration and course fees, conducts video presentations for courses given by video, administers and grades exams, and maintains a student record file. Typically, a capable registrar will relieve the Pastor / Distance Learning Center Director of most of the routine responsibilities of the school. In addition, grade reports are mailed to each student by the school Registrar. Select a Name. It is best to select a School of Ministry name which appeals to the community. Our recommendation is to name your School of Ministry along the lines of “Chesapeake Bible Institute of Anytown” or similar. Next, a local Distance Learning Center sign is erected in a visible location near the church entrance. This helps identify the local Distance Learning Center, both to local church members and potential students from the surrounding community. Plan a Course Schedule. A three-year academic schedule of courses is developed. The academic year includes Fall, Winter, Spring, and Summer terms. A term typically is seven to ten weeks long, as determined by the Distance Learning Center Director and Registrar. Classes usually meet for two hours, once per week, during the term. The local Distance Learning Center may specify actual class length and frequency. If video courses are planned, classroom video equipment is required. Organize Your Forms. Forms are needed to accurately administer the School of Ministry. These forms include an admissions form, course registration form, class record form, individual student record form and a certificate of completion for each course. Promote Your School of Ministry. Promotion of the school is very important and typically is led by the Distance Learning Center Director and the Registrar through announcements, posters, brochures, and word-of-mouth. The surrounding community and other churches are notified via posters, public service announcements in the media, letters to other church leaders, etc. Registration is held. This may be done at any convenient time, such as immediately following Sunday morning services for the two or three weeks preceding the start of the first class. In addition, students may register at the first or second class meeting. At this time, an itemized list of fees and book costs (if known at the time) should be provided to each enrolling student. Charges over and above those recommended by Chesapeake are the prerogative of the local Distance Learning Center Director and Registrar. Call us today! We’re happy to answer all of your questions and to welcome you into the family of excellent Distance Learning Centers associated with the Chesapeake Bible College & Seminary. You can reach us at 410-634-9005 (ask for the Distance Learning Center Department) and or email us at Distance.Learning@ChesapeakeBibleCollege.org.